Find artworks, auction results, sale prices and pictures of Georges Washington at auctions worldwide. 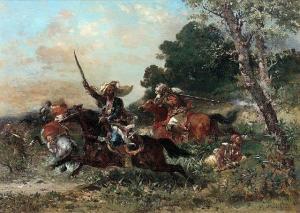 Lot 3251 - A188 19th Century Paintings - Friday, 29. March 2019, 04.00 PM GEORGES WASHINGTON (Marseille 1827 – 1910 Paris) Scouts. Oil on canvas. Signed lower right: G. Washington. 60 x 76.5 cm. Provenance: Swiss private collection. Our thanks to Noé Willer who has confirmed the authenticity of this work on the basis of a photograph. FRENCH RETURN FROM THE RAZZIA Georges Washington 1827 - 1910 signed G. Washington lower right oil on canvas 142 by 200cm., 60 by 78¾in. 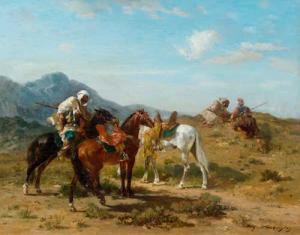 Provenance Sale: Sotheby's, London, 13 June 2006, lot 209 Purchased at the above sale by the present owner Exhibited Paris, Salon, 1876, no. 2059 (as Retour d'une razzia) Catalogue Note In this monumental work, Washington depicts the return of a raiding party tothe walled city of Oued Rhiou in modern-day Algeria, located in the desert between Oran and Algiers. 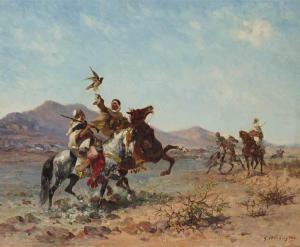 Arazzia, referred to in the title, is via French from the Algerian Arabic ġāziya, meaning a raid, especially one carried out by Moors in North Africa, forthe purposes of conquest, plunder, or thecapture of slaves. 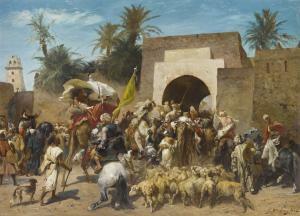 Washington was a prolific painter of North African scenes,exhibiting them regularly at the annual Paris Salon from the late 1850s onwards. Like Schreyer andRousseau, he was inspired by thebravura, dynamic brushstroke, and dramatic paletteof Eugène Delacroix. The present work is not only probably Washington'slargest painting,filled with movement, it is also one of his most ambitious compositions. Anonymous sale; Gros & Delettrez, Paris, 5 December 1994, lot 214.